The OMP CEFAL3 is the smallest FIA extinguisher on the market!!! Ideal for those competing in single seaters (especially historic) with little or room for an extinguisher system but not wishing to compromise on performance/safety. The CEFAL3 is an electrically controlled unit. Made from aluminium for lightweight and reduced dimensions. 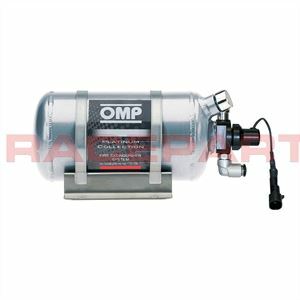 The OMP CEFAL3 extinguisher is available as either a complete kit (includes everything you need to install the unit) or as just a bottle. It is also available to ship either pressurised or un-pressurised (if purchasing an un-pressurised system then please not you will need to get the unit pressurised before competing, this option should only be selected if surface shipping is impossible, please call or email for details).